Most of the time in Word 2013 documents, aligning paragraphs refers to horizontal alignment, or where the paragraph aligns in relation to the right and left margins. 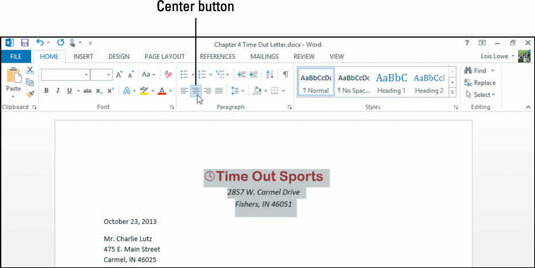 In Word, your choices are Align Text Left, Align Text Right, Center, and Justify. Here is an example of each of the alignment types. Horizontal alignment refers to the positioning of the paragraph between the right and left margins. Vertical alignment refers to how paragraphs are positioned between the top and bottom margins. Most documents start at the top, but you can align documents to the center or bottom of your document, too. You might use this feature if you’re creating a cover page, for example, or a business letter. Each of those is pretty self-evident except the last one. Justify aligns both the left and right sides of the paragraph with the margins, stretching out or compressing the text in each line as needed to make it fit. The final line in the paragraph is exempt and appears left-aligned. If you apply Justify alignment to a paragraph that contains only one line, it looks like it’s left-aligned. However, if you then type more text into the paragraph so it wraps to additional lines, the Justify alignment becomes apparent. Select the some lines, the first three in this example, then choose Home→Center or press Ctrl+E. Click in a body paragraph (in the following example the paragraph that starts with “Thank you . . .”) and then choose Home→Justify or press Ctrl+J. The paragraph changes to Justify alignment. 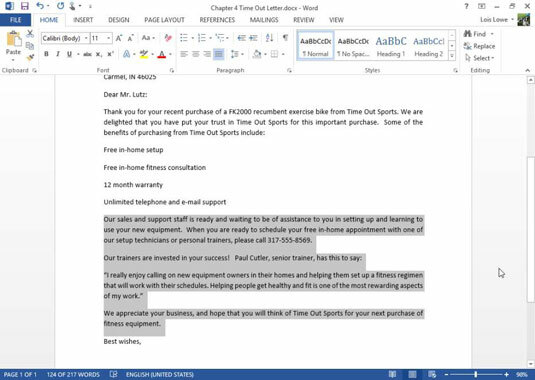 Select the additional body paragraphs of the document (the last four paragraphs in this example, starting with “Our sales and support staff . . .”) and click the Justify button again. Those paragraphs change to Justify alignment. Save the changes to the document.